Given that tourism plays a big part in a nation's economy, it's no surprise that hotels all over Malaysia are constantly working to up their game and give travellers the best experience possible during their stay here, with great service and knowledge of their state. A few weeks ago I got to meet with this year's Sabah Hospitality Ambassadors, chosen by the Sabah/Labuan chapter of Malaysia's Association of Hotels (MAH) during the 40th anniversary celebration at Le Meridien Hotel. They told me the objective of this competition is to select an industry employee who would present a positive image of tourism in Sabah - a warm and friendly personality who is not only passionate, but also committed to their career as a hotelier! 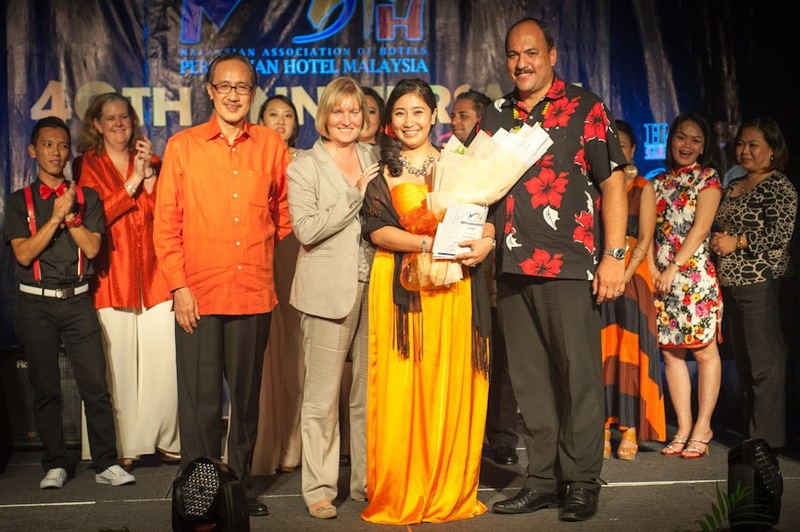 The winner, in this case Ms. Zetty Raudhah Crehan of Sutera Harbour Resorts, will represent Sabah for the MAH National Employee of the Year award, co-represent MAH Sabah at official Ministry of Tourism functions, and be a spokesperson at career inspiration and guidance talks held by MAH Sabah Chapter member hotels. It wasn't an easy task, winning the award; a total of 11 participants were judged on their personal appearance, presentation, personality, intelligence, and communication skills. Zetty definitely has the experience and the charisma to represent Sabah. Starting out as a flight attendant with Malaysia Airlines, Zetty regaled stories of her adventures in the sky, and subsequently on sea when she was Cruise Director for luxury cruise ship SY Lili Marleen! Deciding it was time to return to solid ground, Zetty now heads Pacific Club at The Pacific Sutera, and I can personally confirm that hospitality is definitely her forte! Her favourite part of Sabah? Tuaran, because it's not too far from the city, yet offers beautiful beaches, gorgeous wetlands, and amazing food! 1st and 2nd runners-up Haeruddin bin Nordin and Mohd Fauzi bin Latip, from Four Points by Sheraton Sandakan and Gayana Eco Resort respectively, also make their passion known, especially when talking about their workplace: Haeruddin names two of his managers at Starwood Hotels and Resorts as his mentors and inspiration, while Fauzi has definitely made his rounds to gain experience in various hotels around Malaysia, since 2001! When asked where their favourtie place in Sabah was, Haeruddin says the cultural experience of the Sabahan cowboys in Kota Belud has his heart; Fauzi, spending most of his time on the sunny Pulau Gaya, where Gayana Eco Resort is situated, loves taking trips up to Kundasang to cool off! Me with the top 3 Sabahan Hospitality Ambassadors! I hope this yearly award will inspire those in the hospitality line to give their ultimate best, not only to be in the running to win next year's honour of being Sabah Hospitality Ambassador, but also to carry the name of our state's tourism above and beyond what we have achieved so far. Sabah is such a beautiful state, and those in the Tourism and Hospitality industry are front-liners to showcase our Sabahan pride!